The autonomous region of Rojava, as it exists today, is one of few bright spots – albeit a very bright one – to emerge from the tragedy of the Syrian revolution. In the last decades the Kurdish struggle for freedom was not only a firm voice of resistance against the dominant social and political order, but also managed to formulate and initiate practical steps towards the realization of a liberated society. After many years of oppression, the Kurdish forces began to regroup, forming armed units of self-defense. During the period in which the leftist Kurdish Democratic Union Party (PYD) was quickly turning into a regional political power, a new antagonistic example appeared in the midst of the Kurdish liberation movement, based on the values of democratic confederalism and autonomy. Already before the beginning of the uprising in Syria, residents of Rojava had created the first self-organized councils and committees, and hence had begun to establish a radical democratic organization for the majority of the population in the region. Since June 19th, 2012 the cities Kobane, Afrin, Derik and many other places were liberated from the control of the Syrian regime, revealing the power and the influence of the Kurdish struggle. Military bases were occupied and the overwhelmed government troops chose to surrender. Nowadays this new paradigm of autonomy and self-organization is being threatened both by the Turkish army from the North and by fundamentalist theological forces from the South, like ISIS and al-Nusra – organizations who traditionally are aiming at imposing heteronomy, centralization, patriarchy, theological violence and exploitation. Principles which the communities in Rojava strongly and actively oppose. In one of the most difficult geopolitical environments, they are laying the foundations of a new world based on democratic confederalism, gender and ethnic equality and community economy. In Rojava, we believe, genuinely democratic structures have indeed been established. Not only is the system of government accountable to the people, but it springs out of new structures that make direct democracy possible: popular assemblies and democratic councils. Despite the widespread belief that the contemporary social conditions are too complex and self-organized forms of social organization are doomed to work only on a small and embryonic level, the radical political organization of the communities in Rojava gives a modern example of autonomous self-institutionalizing and direct democracy. This is being achieved through the processes of the democratic confederalism. The core of this system are the communes . The communes, established in each province of 300 people, are general assemblies, allowing broad public participation. In the communes are being discussed issues concerning all aspects of social life, starting from the technical and administrative issues up to the political ones. Issues such as energy, food distribution, patriarchic violence and family tensions are being tested at the table of the political debate. Each commune set up local single-issue committees with the task to discuss more specific topics in order to avoid bureaucracy and ease the operation of the general meetings. It is important to note that it is required each commune to be consisted at least of 40% women. Each commune elects 2 revocable delegates to participate in the regional councils, in which is done the coordination between different communes which make up each region. There again are being elected delegates to take part in the city council, and then according to population criteria are being established the cantons. The cantons are the broadest and most central form of political organization in Rojava and basically they function as coordinating body between the different cities. Before the revolution women had no ability to speak or make a decision. Now we have such an ability. We are active in every sphere. One of the most interesting parts of the social experiment that is currently taking place in Rojava is the role of women and the goals set up by local communities to achieve isomeric relations between the sexes. In a region such as the Middle East, which we are used to identify with the fundamentalist oppression of women and sexuality, the self-organized communities of Rojava provide a pioneering example of equality. The conscious political effort to equalize the relationship between men and women is reflected both institutionally, and socially. In the midst of an ongoing military conflict, usually favoring social automation, militarism and patriarchal imposition, the communities of Rojava are real proof that the political will and choice can overcome that which seems as necessity. One characteristic example for this political goal are the women councils, formed by the communes. These are councils, within which no decisions on general issues are done, but are dedicated to the discussion of issues related to gender relations, violence against women and in general all questions concerning the relationship between the sexes. Of course this did not happen overnight. Already in 2003 was established the Free Democratic Women’s Movement (DÖΚΗ) , a grassroots organization fighting from back then sexism and patriarchy, but also more generally nationalism, militarism, environmental destruction, economic exploitation etc. The fundamental basis of this “Social Contract” is the equality and rights of all ethnic, racial and religious groups in Syrian Kurdistan, direct democracy and the rejection of the concept of the nation-state. A common misunderstanding is that when discussing the issue of Rojava it is usually being identified purely as national liberation struggle. In contrast however with the traditional national liberation movements, which usually are targeting the creation of nation-states and national consciousness, the communities of Rozava are aiming at self-institutionalization from below, promoting a new paradigm of territorial claim . The core of the social organization ceases to be the national identity of each person, and its place is being taken by the form of politicized citizen participating in social affairs. It’s not by chance that in these communes participate people from all ethnic and religious groups of the area (Kurds, Syrians, Yazidis, Christians, Muslims etc.) with the only condition to respect the political principles of equality and horizontality. Furthermore, in support with the resistance of Rojava have been established political forms of solidarity such as the Lions of Rojava , formed by volunteers from all around the world, fighting alongside the YPJ / YPG, reminding us for forms of solidarity, that we can see from the days of the Spanish Civil War. It should be added also that international missions of academics  are visiting Rojava in order to come in contact with the social experiment there and learn from the actual forms of enlarged self-institutioning. Though only just beginning, this economic model has, with great determination and in spite of the war, been realised in praxis by many in Rojava. Another main characteristic of the struggle of Rojava, completing and deepening the above mentioned elements, is the alternative economic management it practically proposes. The economic organization of Rojava is a reflection of its political project. The communities themselves call it “community economy”  and all parts of the population participate in it through production and trade cooperatives. The main goal of its economic activity is not growth, but the creation of local autarchy. Except necessity (since Rojava is being isolated and surrounded by hostile environment), this is a political choice in the direction of social ecology and liberation from capitalist exploitation. For couple of years now they are trying to develop these forms of community economy through the establishment of academies, promoting the cooperative spirit and organizing seminars and discussions on the benefits of collaborative production. Through these economic structures they are trying to meet the needs of their communities and simultaneously to keep the “war economy” going, which they need since the constant military conflict. In nature, living organisms such as roses with thorns develop their systems of self-defense not to attack, but to protect life. The defense forces in Rojava resemble the principles of direct democracy and equality, embraced by the Kurdish communities. Men and women fight as equals since YPG (People’s Defense Units) and YPJ (Women’s Protection Units) military structures and battalions are separated, but there is no hierarchical relationship between them and the main barracks and the work systems are the same. Also military commanders are being elected by the battalion soldiers , based on their experience, commitment, and willingness to take responsibility. Dedicated to enlightenment and political consciousness, the Rojavan defense forces have established academies which to provide ethical-political education to the fighters of the various units (YPG, YPJ, Asayish etc.). The provided education is mainly focused on gender equality, anti-militarism, dialectic resolving of disputes, the values of democratic confederalism etc. Because of these characteristics the struggle of the communities in Rojava can be viewed as integral part of the grassroots projects and radical endeavors, starting with the Zapatistas in Mexico, spreading to every corner of the Earth and culminating in global effort for social liberation, against both statist and capitalist management, theological obscurantism, exploitation, patriarchy and every form of oppression. The positive aspects of the social experiment, taking place nowadays in Rojava, shouldn’t be neglected in the name of ideological/dogmatic “purity”, as we saw different libertarian organizations  taking stance against the events going on there, because of the historical background of some of the main characters in the Kurdish resistance movement (Öcalan, PKK etc.). Surely we have to keep in mind its authoritarian background but our attention should also be focused on the willingness of the Rojavan communities to open spaces of emancipation and participation, and how we could help them strengthen their democratic structures, become more self-sustainable and antagonistic to the dominant statist and capitalist forms, thus providing us with one more contemporary practical example for another society. The positive aspects of the social experiment in Rojava shouldn’t be neglected in the name of ideological ‘purity’, as we saw different libertarian organizations taking stance against the events there, because of the historical background of some of the main characters in the Kurdish movement. The efforts of people to defend themselves when under attack and carve out some measure of freedom in their everyday life are to be welcomed but....the 'integral' internationalist and 'anti-capitalist' claims made here on behalf of both the Mexican Zapartistas and the Ocalan/PKK inspired social movement in Northern Syria and Turkey are in my opinion misplaced, as contrary to the ideology of 'Social Ecologists' and others smitten with the 'democratic fetish' they are specifc to their regions and history and do not occupy a common material economic or class base with the rest of the developed capitalist world. The reference back to the 'Spanish revolution' bears a resemblance only in terms of the conditions of defeat of that nascent social revolution at the hands of civil war and international isolation. ...the 'integral' internationalist and 'anti-capitalist' claims made here on behalf of both the Mexican Zapartistas and the Ocalan/PKK inspired social movement in Northern Syria and Turkey are in my opinion misplaced, as contrary to the ideology of 'Social Ecologists' and others smitten with the 'democratic fetish' they are specifc to their regions and history and do not occupy a common material economic or class base with the rest of the developed capitalist world.. But you say "the rest of the developed capitalist world", as if it was the bulk of the global proletariat. Which it ain't by a long chalk. Global population is 7 bn, of which ~1.25bn are the OECD (usually associated with "the developed capitalist world" - and yet now includes Mexico, Turkey, Chile, Korea, various East Europeans, etc.). The majority of the global proletariat are now in countries outside of the "rest of the developed capitalist world" many of them, like Chiapas and Kurdistan where pre-capitalist social relations and structures are crashing into capitalist development in a matter of only decades. In terms of numbers alone, the regions outside of "the developed capitalist world" represent not the margins of global capitalism, but it's 21st century core. Everything is specific, nothing is general at this stage. And the fact that the women's organisation within the PKK were able to recognise something necessary to them in the Zapatista's Revolutionary Law on Women, from half a world away, despite the radically different histories and regional conditions of Maya indigenous and Kurds, speaks to the fact that there may be far more resonances between the problems of the Emergent world proletariat than might be at first thought. I don't think your conception of the dominant norm really stands up to a materialist analysis of the global composition of capital in the 21st century. The global proletariat are in precapitalist social relations? More sloppy thinking! Sorry but that does not make any sense. The bulk of Kurdish proletariat has already developed and they live in western Turkey, in Istanbul, Izmir and other industrial towns. And the world proletariat is concentrated in two major zones; The old center (Europe-North American North Atlantic axis) and a new one in East/South Asia. Hardly anything will emerge in Iraqi and Syrian deserts in the immediate future. .the 'integral' internationalist and 'anti-capitalist' claims made here on behalf of both the Mexican Zapartistas and the Ocalan/PKK inspired social movement in Northern Syria and Turkey are in my opinion misplaced, as contrary to the ideology of 'Social Ecologists' and others smitten with the 'democratic fetish' they are specifc to their regions and history and do not occupy a common material economic or class base with the rest of the developed capitalist world. I can not believe you say that. I am sorry but this is so primitive Hegelian narrative I just can not believe what I see as passing as communism in UK (I suppose). So there are developed countries whose structures are so universal and generalizable -unlike the undeveloped world which is culturally and regionally specific- It is as if whole history is inevitably a certain development of a moving "mode of production" in which no singular political actor, no technological innovation no development of ideas or cultures matter at all. And Communist must only be interested in just the coming European(maybe now also USA) Revolution. And development of particular struggles to specific regions or problems is somehow appear to a "communist" just as a derivation from a true path. It is as if no culturally or historically specific singularity has no effect at all (and not to repeat but this specificity is just the problem of the undeveloped world). It is as if even the failure of Rojava in its specific anti-capitalism (based some sort of commune based democratic political control over the economy) will be not a lesson in the overall history of socialism It is as if the prime objective of communist is prevent (at least in a for of comment on every relevant text) it. It is very sad the communists of the developed world on the one hand pose as the holders of he key to the true keys to the communist "heaven", but on the other hand this supposed key appears to be so irrelevant in their home countries they spent their time educating people of the undeveloped world (about which Dauve's text is prime example). I wish "such" communists of the developed world come to terms with what they really are theoretically and politically. This could not only benefit the undeveloped world but also themselves in their struggle. Ok let me clarify my reference to developed capitalist world which is not meant (as perhaps mf alludes ) to necessarily the divisions between the borders of todays specific countries, already less significant however real, in terms of the global capitalist economy. In terms of the defensive struggle military and social in Chiapas, already significantly different to that in Rojava, I am in no way unsupportive but the Zapatista political programme for Mexico was essentially still nationalist and anti-imperialist rather than anti-capitalist viewed from a communist perspective. On another thread in discussion with ocelot I indicated that I recognised the benefits that might accrue from some of the changes underway in the social struggle within Rojava but saw these rather as a process of capitalist modernisation and integration rather than the beginnings of an 'intergral' process of spreading opposition to global capitalism. My view here about the potential of these two movements is based on my understanding of the objective conditions prevailing at the present time in terms of both the global economy and the imperialist divisions of the world. I am well aware of the weakness of the working class even in defensive term in much (though not all) of the developed capitalist world in the light of past defeats and political diversions and would not be so arrogant as to tell people in Rojava or Chiapas or anywhere else what to do or not do, especially in the exceptionally difficult circumstances they face, which I do not. It doesn't follow that I should uncritically take on board the unwarranted claims made on behalf of these movements mainly by poltical organisations outside of those areas who have their own ideological axe to grind. But you are the one who is claiming (just to refute) that Rojava is the anti-capitalist society per se. The text does not mention that. Or again it is you (and again to argue for the contrary) who says Rojava is today's Spanish Revolution. The text just says as in Spanish Civil war there are internationals coming to war to fight against fascists (which is formally kind of true right? ). As you make such claims and disprove them yourself. This really force me to reply back to you and this brings all us back to the circle of discussion that is futile. And as we are not trolls (as most of us on this forum are not) we just get bored, exhausted and even after sometime hostile in the end. After all, did we not still go beyond the point that no struggle all by itself given in a certain context is not guarantee for a permanent world revolution (or whatever you name it). 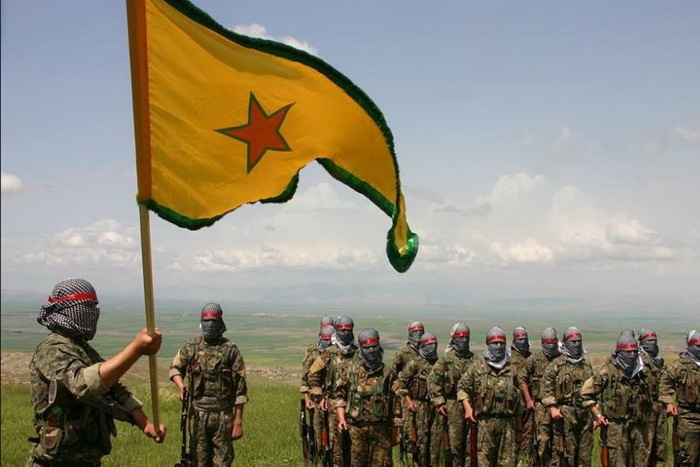 Neither Zapatistas nor Rojava. Nor even Spanish revolution, right? Parallel to this won't we need fight against the ethnic/national/orientalist biases and practices in our (currently) imaginary global movement of workers all the time, possibly even after our imaginary social revolution/dictatorship of the proletariat? As many of the real things (unlike you mentions as if they are argued) addressed in the text above (things like sexism, centralism etc..) -although currently articulated very firmly into the capitalist system of exploitation- are not in fact "just" problems of capitalism itself? but rather systems of oppression that has their own histories and they "do" deserve to be fought against, right? So in short: I see contra-Rojava texts and crowd (sorry for generalization) mistakenly argue that pro-Rojava people claim that Rojava is the only way to move forward. In reality though this is just futile speaking and empty argumentation and at its worst just alienation of many people of the undeveloped word (or people with "specific" problems as we discussed above) from the political line "we" want to advocate as insensitive to their positions. ( I took liberty to include you and all libcom here under this we). I actually has a load of words to say about for example texts like Dauve (let alone Devrim's text or Anti-War's continues production of texts by same material and unrelated photes) which is considered to be internationalist but apart from its conclusion just dedicated to prove that Rojava is just a lie propagated by a political body, but let's leave it for now.